igame is an awesome casino gaming service that boasts everything players need. The team behind iGame comprises of 60 talented people who work from Estonia and Malta. The online casino site offers multi-lingual services and games from multiple providers such as Relax Gaming, Net Entertainment (NetEnt), and Microgaming. The community of players at iGame includes 1 million customers from different parts of the world. A brand belonging to iGame Malta Limited, the online casino operates under a license granted in Malta. Furthermore, this license allows players from EU member states to gamble without having to pay any tax on their winnings. iGame Casino is situated in Malta and was established in 2008.
iGame Casino utilizes an elegant and sophisticated casino website that continuously features different casino game animations and switches between the latest casino news and promotions on the homepage. The website is filled with state-of-the-art graphics and vibrant colours, making you feel right at home. Navigating through the different sections of the casino webpage has never been easier and to find the perfect game can be accomplished with a simple click of a button. The homepage has several different slide shows, promoting the latest sign up offers, progressive jackpots, latest game releases and free spin offers. 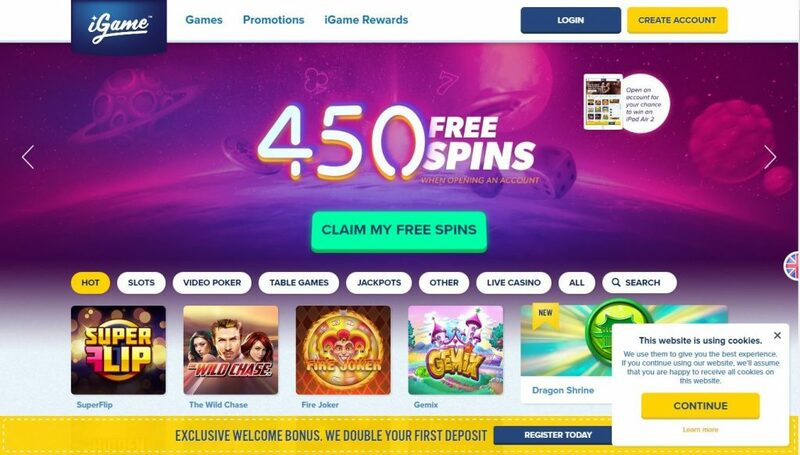 The iGame Casino website is decorated in white, yellow and blue colours and features three main categories located at the very top of the homepage. You will be able to view the entire game arsenal by clicking on the games category, read about the latest bonus offers by selecting the promotions category and jump straight into the casino’s loyalty program when you click on the iGame Rewards category. In addition, you can log in directly through the website by using your login details at the top of the web page or create a brand-new account by selecting the Create Account button. Furthermore, you can select your appropriate language and chat to the support desk with both functions located on the left-hand side of the screen. There are four different languages to choose from, and the live chat button will give you direct access to their friendly and well-educated support desk for any requests or queries you might have. The game selection at iGame Casino is extremely user-friendly and only takes a few seconds to familiarize yourself with the game filters, located further down on the homepage. You will be able to categorize the games by Slots, Live Casino, Jackpots, Other, Table Games, Video Poker games and the hottest games for the month. iGame Casino also has a search function that will make life a little easier when you already know the game you want to play. The Slots section features over 100 different slot games, but you will not be able to sort them alphabetically or by themes. You will need to scroll through the entire collection to find what you are looking for which does create a bit of confusion. The other game filters function the same, so if you not too sure what a specific game is called, you are going to spend some time searching for it on the website. Located at the bottom of the homepage are more helpful links that will give you better insight on the casino’s help and support, security and privacy, affiliate programme, casino rules, terms and conditions, responsible gaming and about iGame Casino. You will also notice a facebook link and the different payment methods you can use to make a deposit at the casino. IGame offers bonuses on several deposits made by players, adding up to a total bonus of €250 plus 125 free spins. If players input the bonus code IGAME11, they will receive a match bonus of 100% up to €50 plus 25 free spins on Twin Spin slot. If players input the bonus code IGAME22, they will receive a match bonus of 50% up to €50 plus 25 free spins on Starburst slot. If players input the bonus code IGAME33, they will receive a match bonus of 25% up to €100 plus 50 free spins on Gonzo’s Quest slot. If players input the bonus code IGAME44, they will receive a match bonus of 200% up to €50 plus 25 free spins on Piggy Riches slot. Needless to say, these bonus offers are associated with various terms and conditions. Players should first read and understand these terms and conditions before claiming any of these bonuses. In addition to a loyalty program, iGame features a refer-a-friend program, which gives players a chance to earn a bonus of €50 for every friend referred. The games portfolio at iGame Casino is literally packed with attractive Net Entertainment (NetEnt) and Microgaming releases. iGame Casino features every kind of game you can possibly think of but is mostly renowned for its slot gams. You will be able to enjoy a wide selection of classic slots and video slots from the two leading software providers in the world. These slot games include titles such as Twin Spin, Thunderstruck II, Big Bad Wolf, Gonzo’s Quest, Starburst, Avalon II, Jurassic Park, South Park, and much more. Those who love fast-paced table games can enjoy a vast collection in the table game virtual section. The casino offers favorites like Baccarat, Texas Hold’em Poker, Caribbean Poker, American Roulette, European Roulette, Double Exposure Blackjack, Single Deck Blackjack, and several others. For video poker lovers, you will be able to play up to four different variants at iGame Casino and include All-American Poker, Joker Wild, Deuces Wild, and Jacks or Better. Each of these video poker games can be played in both multi-hand and single-hand denominations. The iGame Live Casino provides you with the perfect opportunity to enjoy authentic table games from the comfort of your own home. All the live casino games featured at iGame Casino are broadcasted from Net Entertainment studios and hosted by actual dealers in real-time. iGame Live Casino also ensures that members have virtually no bet restrictions and there will be no need to fight for a seat as there’s always a seat available when you access the live casino section. iGame Casino Mobile primarily caters to European players. The mobile app features over 40 different games provided by Net Entertainment and can be enjoyed on iOS, Android, and Windows Phones. You will also be able to claim an impressive 100% match up to $250 for signing up with the mobile app. If you can look past the lack of languages, payment options, and currency selections, you will have a fun and thrilling experience on the iGame Mobile Casino. iGame Casino has not yet managed to obtain any awards for their efforts in providing a thrilling online casino experience. Although the casino uses the best casino software from Microgaming and Net Entertainment, iGame Casino does not mention anything in terms of awards on their website. There are several countries that will not be able to play at iGame Casino due to strict regulations and these countries include United Kingdom, Ireland, Germany, Cyprus, Canada, U.S Minor Outlying Islands, Span, Nigeria, France and its territories, Italy, Estonia, Isle of Man, Greece, Denmark, Belgium, Zimbabwe, Turkey, Sudan, South Korea, North Korea, Libya, Iraq, Iran, Hong Kong, Cuba, American Samoa and the United States. iGame has an exhaustive Frequently Asked Questions (FAQ) section, which contains answers to commonly asked queries related to registration, payments, account, promotions, and account verification. If players cannot find answers to their queries in the FAQ section, they can send an email to support@igame.com or use the online contact form for a quick response. The advantages for playing at iGame Casino includes a convenient instant play format that features both Microgaming Quickfire and NetEnt slots and other games. You will also be able to enjoy a live dealer room, and the casino is presented with a live chat facility. All information provided to the casino is safe and secure with the highest SSL encryption technology and is regularly tested to provide the fairest gaming experience. There are a few disadvantages and these include no telephone support at the casino, no jackpot-style or bonus video poker games and the fact that players from countries such as Spain, India, Italy, Estonia, France, Canada, Bulgaria, Belgium, United Kingdom and United States will not be able to play at iGame Casino. The hottest features of iGame are its portfolio of NetEnt and Microgaming games, lucrative promotions, multiple new player bonuses, and a safe and secure gaming experience. To get started, players just sign up for real money play and make a deposit using reliable banking methods such as debit/credit cards or eWallets. Some of the hottest titles at iGame.com are Thunderstruck II, Immortal Romance, The Invisible Man, Attraction, Jack and the Beanstalk, South Park, Mermaid’s Millions, Gonzo’s Quest, Big Bad Wolf, and others. iGame.com also includes a live casino featuring high-resolution streaming, live chat with dealers and fellow players, and automatic dealer-hosted gaming tables.